There are a number of great recordings of this concerto. Among them are ones I have personally listened to over a long period of time, such as EMI's Milstein/Fistoulari/PO, the great Klemperer/National French Radio Orchestra/Oistrakh -- and, friends, that is a very good one indeed! -- on EMI, and, cutting the list short, this one, the Giulini/PO/Perlman performance. Just recently I heard a glorious local performance of this concerto in my hometown with Midori and the Jacksonville Symphony. But these cds are my favorites culled from many over the years. The tossup is between the Klemperer and the Giulini, but the one I listen to most is the sheer beauty and lyricism of the Giulini/Perlman performance. It is very romantic, has the big sound, and nobody exceeds the Chicago Symphony, Carlo Maria Giulini, and Perlman in presenting this concerto. And let me say a word about this concerto. It is in essence romantic music. Just say "beautiful." Like the Dvorak Cello concerto, how does one do it without it sounding like it is? Romantic! Big! Sonorous! Lush! And why do it if it cannot be performed in the mood and spirit with which the music was intended? Well, nobody projects this kind of music better than this performance by Giulini, the CSO, and Perlman. I feel sorry for all the people reviewing this ahead of me who do not like this performance. I have been listening to Brahms over 50 years, and no one does this better than Carlo Maria Giulini, the CSO, and Perlmann. It shows music is more than just playing the notes or running the tempos. Music is for people. And this performance is sensational. It lets the romanticism engrained be released and rule every part of the concert. Go listen to it again, and hear it for a change. Fall in love with music again. Get this disc and be glad you did. It will become your favorite. Yes, there are other great performances. I have mentioned just two others. But one will not find a better performance than this for the intention and type of music that is composed. Get it. Be glad you can. It is a smashing rendition of this music. 5つ星のうち5.0Does not disappoint - ever! so much, i had to have another. so, it was not new to me. While there are many outstanding interpretations of the Brahms Violin Concerto, I've always been partial to Isaac Stern's full and warm tone; not as flashy as Jascha Heifetz, but more heart-felt. In the "Double", Stern joins forces with cellist Leonard Rose, in another smooth and wonderful rendition. Eugene Ormandy and the Philadelphia Orchestra provide ample support, confident but not overbearing. While Zino Francescatti and Pierre Fournier also made a excellent recording of the Brahms "Double" with Bruno Walter (also made for Columbia during the "Golden Age" of classical music recordings); those on a budget would be advised that they needn't purchase both Stern/Rose and Francescatti/Fournier as one is as beautiful as the other, and both are done in with a similar spirit of Romantic style and smoothness of execution. For me, the Brahms "Double" is a favorite, composed for the violinist, Joseph Joachim, as a peace-offering after a falling out had ruptured their friendship. The "Double" is not just a lovely balance of violin, cello and orchestra, but also a testament to the spirit of forgiveness and reconciliation. Though these are old recordings, Columbia's sound technology is quite warm and rich; one that I prefer as far as older recordings go, from the Golden Age of classical music recordings. 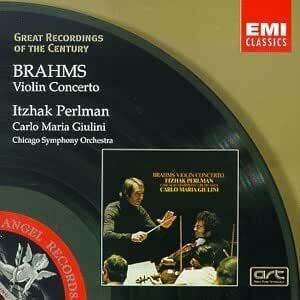 This is a favorite recording of the Brahms Violin and the Double Concerto for me. Previously released on LP records, I wore out my old copy and had to get this recording on CD. I must have a copy in my collection. Stern's tone is pure and soaring... the orchestra support is passionate and superb. This recording defines the art of the violin concerto. I am listening to it for the first time in years and it's more emotionally satisfying than even I can remember... especially the adagio. Stern's tone is beyond compare, not to mention the entire effect of the soloist and orchestra together. Since first hearing it I've never found a replacement performance. Sweet, tender, heartfelt and thrilling!